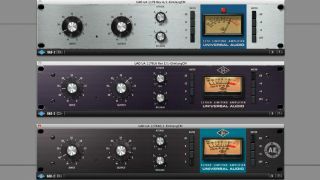 Universal Audio's 1176 Classic Limiter Collection comprises three separate emulations of its 1176 hardware: Rev A, Rev E, and - based on the Anniversary Edition - AE. Most DAWs include at least a pretty decent set of stock plugins, but emulations of classic hardware signal processors remain incredibly popular, so they clearly have something special to offer the desktop producer. With these seven tricks and techniques, we're going to show you how to do great things with some of the greatest compressors of all time. We're using various software emulations (from Universal Audio, IK Multimedia and other developers) of the Urei 1176, dbx 160, Fairchild 670, SSL Bus Compressor and Teletronix LA-2A here, but if you're lucky enough to own any of the original hardware boxes on which they're modelled, almost everything you're about to read will prove equally applicable to those, too. For a complete guide to using classic compressor plugins, complete with video tutorials, pick up Computer Music 208, which is on sale now. Some of the classic compressors include very tasty valve and transformer stage circuitry before and after the gain reduction section. This means that simply inserting the compressor with no gain reduction can result in beneficial harmonic distortions. Both the LA-2A and Fairchild 670 include transformer stages and valve amplification, and are ideal for adding subtle mid-range enhancement and low-mid fatness. You might need to check that your particular plugin actually includes these circuits, though, as some of the older emulations don't. The famous 1176 'all buttons' setting exploits an anomaly of the original circuit design, whereby depressing all the Ratio buttons at once affects the ratio, attack and release in a weird and wonderful way. The result is a very aggressive compression onset, but with a time lag for transients - great for audible pumping effects on drum kit room mics and general sound transformation. You might assume that the 1176's super fast attack and release, and FET distortion wouldn't work too well on bass, but they're actually surprisingly effective. The saturation in the FET circuit adds bite and edge to the sound without destroying the low frequency content, and when driven reasonably hard, this can be great for enhancing electric bass or adding bite and attack to lacklustre synth basses. As the name suggests, the SSL Bus Compressor is most commonly used across the mix bus. Nevertheless, it also makes a fantastic sub-group compressor. It's particularly good on drums, where - once again - a slow Attack/fast Release setup with a few dB of gain reduction works well. However, you can also use it on a wide range of other sub groups, including backing vocals, electric guitars, drum loops and strings. You can often use it more aggressively with such sources than you would on the master bus, too. Great though the original classic compressors are, the freedom and power of software design allows for deep modification and feature enhancement. The most common option found on plugin compressor emulations is filtering of the sidechain signal, but other add-ons include mid/side and individual left/right processing - a standard feature on IK Multimedia's plugins, for example. Sidechain filtering is great for tailoring compressor response to low frequency sounds like kick drums, basses and the bottom end of full mixes - check out the various SSL Bus Compressor emulations (Cytomic The Glue, Slate Digital FG-Grey), or the most recent UAD Fairchild 670. With each one having its own distinctive behaviour, it's unsurprising that pro engineers actually combine their classic compressors in series. A popular chain comprises an 1176 for bite and control, followed by a Fairchild 670 or Teletronix LA-2A to smooth things out and add further focus. The same trick also works using the dbx 160 for containment, rather than the 1176. Also, as mentioned earlier, the more flavoursome valve-based designs can be added to the chain with minimal gain reduction, simply to enhance the signal through subtle harmonic distortion. We've talked a lot about using fast compressors to shape basses - the ideal approach for more aggressive sounds. However, if you're after transparent containment or are trying to enhance the sustain in legato playing, an opto compressor is often easier to set up. Both the LA-2A and the Tube Tech CL1B are ideal for this particular job, with the LA-2A offering more vintage flavour and the CL1B boasting greater attack and release flexibility.